Observations of van der Waals compounds in simple molecular systems at high pressure continue to bring surprises. Indeed, understanding the nature of bonding in these materials is not well understood. 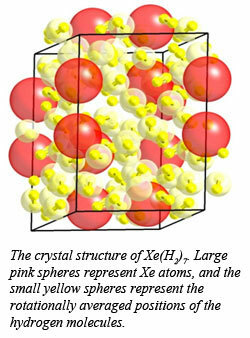 In the course of investigating the Xe-H2 system at high pressure, CDAC Research Scientist Maddury Somayazulu and co-workers from Carnegie and the Advanced Photon Source discovered a class of compounds with stoichiometry ranging from Xe(H2)7 to Xe(H2)8, along with the first experimental verification of bonding states in such materials. A combination of Raman and infrared spectroscopic measurements, along with synchrotron x-ray diffraction experiments, showed that at 5 GPa, a hexagonal phase forms, which may be described as a tripled unit cell of solid hydrogen, intercalated with xenon atoms. The presence of two separate Xe-Xe distances in the structure, however, suggests the formation of Xe2 dimers, in which the Xe-Xe distance is 3.875 A, which is close to the Xe-Xe distance in solid Xe at 5 GPa. At higher pressures, additional hydrogen is taken up by the structure, which suggests a composition of Xe(H2)8 above 5.7 GPa. Infrared measurements show that the material remains an insulator up to 255 GPa. Studies of the electron density maps show a surprising spread of electron density from the Xe2 pairs toward the surrounding array of H2 molecules. It is proposed that this spread of electron density is a signature of the depopulation of the highest occupied and fully filled Σ* molecular orbital of the Xe2 pair produced at high pressure. However, there is no indication at present of a transfer of electron density into the Σ* orbital of the H2 molecule which could lead to its dissociation. This suggests an interaction between Xe2 dimers and H2 molecules, which could lead to different bonding modes at higher pressures or different compositions in the Xe-H2 system. This work has been recently published in Nature Chemistry [Somayazulu, et al., Nature Chemistry, 2 50-53 (2009)].